A correlation is a statistical measurement of the relationship between two variables. Possible correlations range from +1 to –1. 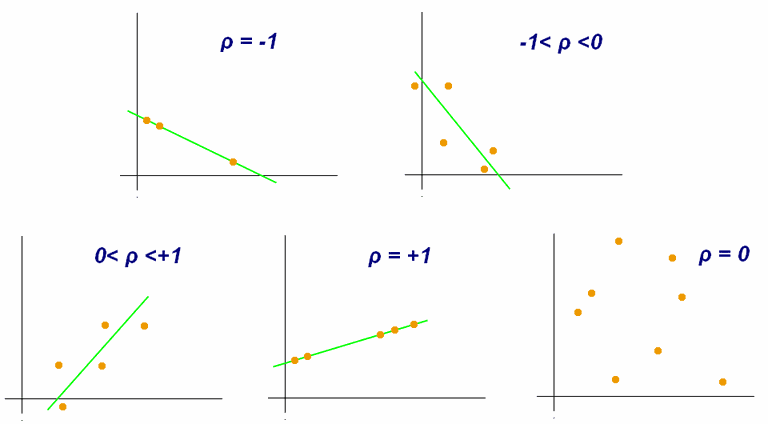 A zero correlation indicates that there is no relationship between the variables. A correlation of –1 indicates a perfect negative correlation, meaning that as one variable goes up, the other goes down. A correlation of +1 indicates a perfect positive correlation, meaning that both variables move in the same direction together. "I just finished taking the research methods quiz, and I think the answers to two of the questions might be wrong. On the one question, I am thinking that the weakest relationship is indicated by -0.74 (c), and not +0.10 (a) as given in the quiz answers. For the other question, I am thinking that the strongest relationship is indicated by +0.79 (b), and not -0.98 (d) as given in the quiz answers. Or maybe I am simply missing a point." When it comes to correlations, be careful not to equate positive with strong and negative with weak. A relationship between two variables can be negative, but that doesn't mean that the relationship isn't strong. A weak positive correlation would indicate that while both variables tend to go up in response to one another, the relationship is not very strong. A strong negative correlation, on the other hand, would indicate a strong connection between the two variables, but that one goes up whenever the other one goes down. Remember, correlation strength is measured from -1.00 to +1.00. The correlation coefficient, often expressed as r, indicates a measure of the direction and strength of a relationship between two variables. When the r value is closer to +1 or -1, it indicates that there is a stronger linear relationship between the two variables. A correlation of -0.97 is a strong negative correlation while a correlation of 0.10 would be a weak positive correlation. When you are thinking about correlation, just remember this handy rule: The closer the correlation is to 0, the weaker it is, while the close it is to +/-1, the stronger it is. So, for the first question, +0.10 is indeed a weaker correlation than -0.74, and for the next question, -0.98 is a stronger correlation than +0.79. Of course (and you've probably heard this a million times in all your psychology classes), correlation does not equal causation. Just because two variables have a relationship does not mean that changes in one variable cause changes in the other. Correlations tell us that there is a relationship between variables, but this does not necessarily mean that one variable causes the other to changes. What Is a Zero Correlation? A zero correlation suggests that the correlation statistic did not indicate a relationship between the two variables. It's important to note that this does not mean that there is not a relationship at all; it simply means that there is not a linear relationship. A zero correlation is often indicated using the abbreviation r=0. What Is an Illusory Correlation? An illusory correlation is the perception of a relationship between two variables when only a minor or absolutely no relationship actually exists. For example, people sometimes assume that because two events occurred together at one point in the past, that one event must be the cause of the other. These illusory correlations can occur both in scientific investigations and in real-world situations. Stereotypes are a good example of illusory correlations. Research has shown that people tend to assume that certain groups and traits occur together and frequently overestimate the strength of the association between the two variables. For example, let's suppose that a man holds a mistaken belief that all people from small towns are extremely kind. When the individual meets a very kind person, his immediate assumption might be that the person is from a small town, despite the fact that kindness is not related to city population. Correlations play an important role in psychology research. Correlational studies are quite common in psychology, particularly because some things are impossible to recreate or research in a lab setting. Instead of performing an experiment, researchers may collect data from participants to look at relationships that may exist between different variables. From the data and analysis they collect, researchers can then make inferences and predictions about the nature of the relationships between different variables. Can Psychological Self-Report Information Be Trusted?